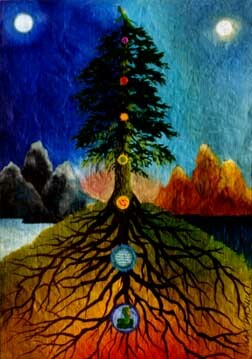 Siberian cosmologies say that a great Tree grows on a mountain at the center of the the Earth. The Waters of Life well up on one side, the healing Waters of Death on the other. Seven planes exist within the Tree, some deep in the Underworld, others reaching into the Heavens. Shamans learn to attain these states through ecstatic chant and dance. Having journeyed through the worlds, a woman dances atop the Tree. With bare branches and top bent askew. Gathered in a bunch, trailed far-flung silken needles. The foam, in drops as large as a ptarmigan, flowed forever. Foam oozed on the holy Earth. And of pure milk formed a lake. They grow, the small filled out, the sickly were made whole. Of that created blessed regal Tree.